The Metrobus was introduced by MCW (Metro-Cammell Weymann) in 1978 as a competitor to Leyland's Titan. The Metrobus was usually supplied as a complete bus by MCW, but some examples were also bodied by Alexander & Northern Counties. 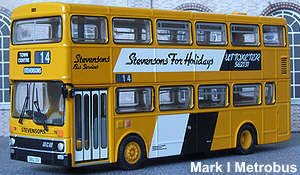 The vehicle proved popular with London Transport who eventually built up a fleet of over 1400 examples, several PTE's also built up sizeable fleets the most notable being West Midlands PTE who brought over 1100 buses. The original mark I version was joined by mark II version which employed a simpler body design that used a smaller number of standard sized body panels, many operators switched to the mark II design however London Transport continued to standardize on the mark I version. A small number of mark II vehicles were eventually purchased by LT in 1985 and used in trials with Volvo B55, Dennis Dominator and the Leyland Olympian which was eventually chosen as LT's new standard double deck design. Many operators managed to get at least 15 years service out of their Metrobus fleet, when finally withdrawn by their original owners many found further service with smaller independents. Sadly MCW got into difficulties in the late 1980's and closed down, the Metrobus thus proved to be their last double deck bus design. 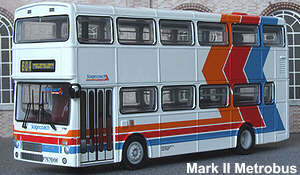 The OOC Metrobuses were launched in 2000, both the mark I & mark II versions can be produced, additionally each can be produced with either single of dual door layout. A version was also produced for the Hong Kong market that featured a half width front entrance, a feature which has to date has remained unique.